You are currently browsing articles tagged Laughing Buddha. 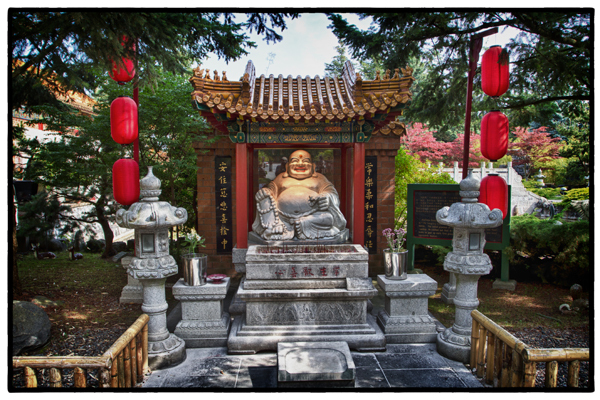 Maitreya, the Laughing Buddha, at the Kuan Yin Buddhist Temple in Richmond. Photo by David Lansing. Laura and I pass by stands selling fresh berries and corn and other produce and then all of a sudden in the middle of this farmland there’s a Sunni mosque and then a temple for Sikhs followed by a Krishna center, Jewish synagogue, and several churches. We are on the Highway to Heaven, on our way to the Kuan Yin Temple, one of the most authentic Chinese Buddhist temples in North America. We walk through the temple’s classical gardens where lotus flowers float in a jade-colored pond surrounded by elegant bonsai trees, all meant to recreate Deer Park where the Buddha Sakyamuni delivered the first sermon to his five disciples thousands of years ago. And there in a courtyard shaded by fragrant cedar trees is my old friend the Laughing Buddha. Except this Laughing Buddha, unlike the one I wrote about on Tuesday that I saw in the Ten Fu tea shop in the Aberdeen Centre, is a little creepy looking. His white face and lipsticked lips make him look like Heath Ledger’s The Joker from the second Batman movie. Which is too bad. Because the Laughing Buddha is supposed to be a good guy. They say that he will be reborn after the degeneration of times and will succeed Gautama Buddha and help people realize their goodness and compassion. But I don’t know. I’m not feeling that way about this particular Joker Buddha. 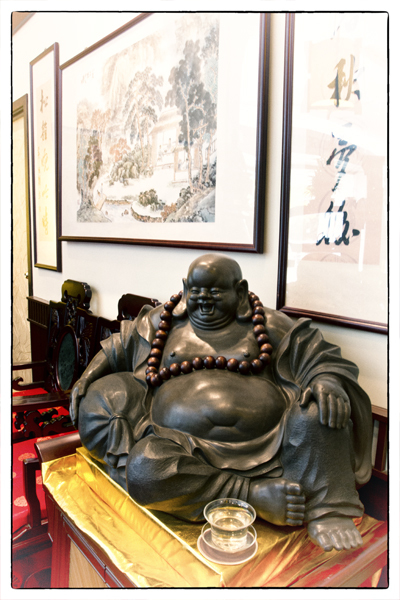 Budai, the Laughing Buddha. Photo by David Lansing. I went back to Ten Fu yesterday afternoon thinking I just might buy a zisha teapot. Instead, I got sidetracked looking at a two-foot-high carving of a Laughing Buddha. This is Budai, which means “Cloth Sack.” You see the bag tucked under the right arm of this cheerful fella? Well the story goes that Budai, who is always depicted as a fat bald man wearing a robe and prayer beads, carries his few possessions in a cloth sack. Hence the name. He is oftentimes depicted as entertaining or being followed by children. Perhaps because they say he went around handing out penny candy to poor children. This Budai is the best I’ve ever seen. There was just something about him that made you want to pick him up (if that was even possible) and take him home. God knows we could all use a little laughing man in our lives, don’t you think? And I still haven’t bought my zisha teapot. Next time I find a good deal on a hotel in Richmond, I will definitely go back for my zisha teapot.